12, 20 & 36mm extension tubes. Uniloc heavy duty tripod with water-sealed bottom sections for standing in rivers. It's a bit weighty for trekking but always worth the effort for total rigidity in strong winds. Various Cullman accessories for angle grips, swan neck supports etc. Over the years I have worked with large and small set-ups. At one stage I carried around a bag with three bodies and lenses from wide-angle to 600mm. After a while I cut right back as I found myself carrying around at least four lenses which hardly got used. If you are trekking for a few weeks that's a lot of unnecessary weight! Nature (especially macro)photography demands the crispness of prime lenses but for two reasons I rarely use them for general photography. Firstly because we can now up the ISO with the touch of a button, making heavy fast lenses less critical and therefore, air travel a lot easier. Secondly, the optical quality of Canon's L lenses is so good that my camera bag is now a child's-weight lighter with a few good zooms. 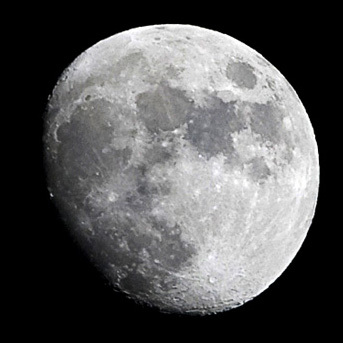 To illustrate the point, the shot of the moon was taken at full zoom with the EOS 28-300L. The moon barely fills the spot metering ring of the focusing screen (which also says a lot about the 1DS mk3's sensor).